'Circle of Oak' is a beautiful compilation album of Jana's chants and songs for journeying around the Celtic Medicine Wheel. It begins with creating the circle with 'Sacred Grove', opening up to the Divine Energy with 'The Source' and then inviting you to step into the sacred circle with 'Morning Star'. The music will then take you on a journey around the wheel of the year, beginning at Imbolc in the North-East of the wheel with 'Brighid our Lady' and proceeding clockwise around the circle, through the seasons and the stages of our lives. 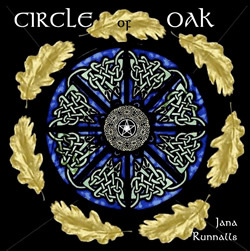 This is a magical collection of Jana's music for all those wanting to journey around the Celtic Wheel of Life. First, check your shipping region! Many of the albums have the same base price but we need to calculate the shipping prices separately.